So it’s been a crazy two weeks here in Oaxaca. Late on the night of September 7th, as it was about to turn into September 8th, the house started to shake. We were in bed – and we often feel smaller quakes here – so we sat there waiting for it to end. But after 15 seconds, it got stronger and stronger and didn’t stop. Windows and cabinets started to rattle – as did all the glassware in our kitchen. So we got up and ran around doing all the things you shouldn’t do during an earthquake, like trying to keep breakables from falling and standing near windows (in our defense, one entire wall of our apartment is windows). Eventually, we stood in one of the doorways in our hall hugging each other and willing it to stop. It seemed like it went on forever. Reports say it lasted 2.5 minutes. It was an 8.2 earthquake – the largest in Mexico in a century – and it struck off the coast of Chiapas about 400 miles south of us. After it was over, we heard our neighbors going outside. We didn’t know if that was what we were supposed to do as well, so we went downstairs and chatted with them for a bit. She was afraid of replicas – aftershocks – and scared to be inside. There was no visible damage and nobody else in the street. It was eerily quiet. So we went back upstairs after a few minutes. We got online on one of our local Facebook groups – where friends and neighbors were checking in. It seemed like everyone in town was shaken up but okay. I posted a note on Facebook saying that we were okay. We sat around watching the earthquake app as aftershock after aftershock was registered (although we didn’t feel any of them). Our landlady’s son came by to check on all of us on his way home from checking on his mom – who lives nearby. Everyone was fine, although badly shaken and frightened. Eventually, we decided we should at least try and sleep. So we got back in bed and turned out the lights – but I don’t think we slept at all – both waiting for the house to start shaking again. In the morning, it was business as usual. We got up to do some work. I called my parents, managing to catch them in that brief period of time between when they woke up and when they turned on the news or read the paper. Friends and family from all over the world checked in with us to make sure we were okay. Kyle went to the market – sending me text messages that everything seemed fine in town. There were reports that a big aftershock was coming (even though there is no way to predict that) and we still had a good bit of anxiety about aftershocks, so Kyle hurried home because we didn’t want to be separated if something happened. Reports started to come in about how badly the quake damaged the Istmo – a region down in the southern part of Oaxaca state. 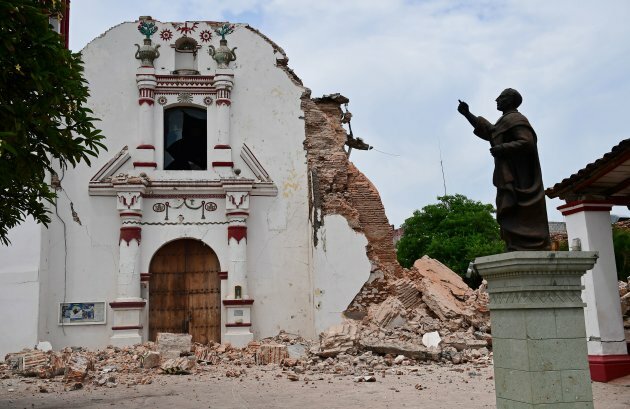 Juchitan was badly damaged – as were many other places in that area as well as further south in the state of Chiapas. Families and towns in the mountains also suffered. These are some of the poorest places in Mexico, and the building construction in these areas is not great, so a lot of buildings simply collapsed, killing and trapping people, but also leaving the survivors with nowhere to sleep or work. Schools and hospitals were destroyed. Calls for volunteers, medical personnel, and food and medical supplies began to come in. Groups all over the city set up Centros de Acopios – collection centers where you could drop off supplies. We donated supplies, gave money, helped in any way we could with sorting and arranging things. There was even a benefit concert here last week – featuring some of the most famous performers from this state. We bought the most expensive tickets because all that money goes to help. I feel like the anxiety from that quake was finally ebbing away this week. Life for us was starting to feel normal again – and not like we were doing all the normal things, but with a bit of hesitation as we anticipated the next quake. It helped a bit that there were more than 3,000 aftershocks – but we only felt 5 of them. We’d slipped back into not worrying about it as much – and then the second quake hit this past Tuesday. We were sitting at the dining room table working when it seemed that things started to slowly shake a bit. A plane was flying low overhead at the same time, and at first we thought maybe it was the vibrations from the jet. But then it got stronger – things clattered again – we grabbed our laptops and went and cowered in the doorway. This one was different than the last one. The first one was mostly side to side shaking motion. But this one was all up and down. For several days afterward, I felt like my equilibrium was off – similar to that feeling you have when you’ve been on a boat for several days and then you’re suddenly back on land, but things still seem like they’re swaying. I must have asked Kyle 100 different times if that was an aftershock we were feeling – when in fact it was just my nervous system and brain telling me lies. Once it was over, we checked in with friends and neighbors here to make sure everyone was okay. The local facebook group for expats started humming as people checked in from all over the area – scared and shaken but okay. No damage again in the city and surrounding area. I posted on Facebook again that there was an earthquake and we were fine. We finally got information on the epicenter – which was in the state of Puebla about 150 miles north of Oaxaca. Immediately, we began to worry about Mexico City and Puebla – both places we love and where we know people. And then the reports and cellphone videos started coming in – collapsed buildings all over. People trapped or killed. We finally had to stop watching. My parents called us to make sure we were okay – my mom telling us that we should fly home if we don’t have anything else going on this week. I didn’t have the heart to tell her at the time that even if we did want to leave Oaxaca it was impossible. Oaxaca is pretty isolated, and it’s hard to fly to anywhere from here without going through Mexico City. Aside from a few flights that go directly to the US, most other flights have a connection in Mexico City (which was damaged in the quake and closed at the time). Buses also weren’t possible, as the freeway north of here to Puebla was damaged. Even if we wanted to leave on Tuesday, we were effectively trapped. And the truth is that Oaxaca City is a pretty safe place to be during a big quake. It’s a low rise city built on stable ground. Our buildings shake but none of them fell. Eventually, we left our house to get away from all the footage – to walk off some of the anxiety and stress – and ended up at a favorite bar drinking mezcal cocktails. There is a saying here in Oaxaca. “Para todo mal, mezcal. Y para todo bien, tambien.” It means, for all that is bad, mezcal. And for all that is good, too. It was one of those times when this toast has really resonated with me. It was eerily quiet again out in the streets – I think everyone had gone home to family and to check on their homes. After drinking, and checking in with more local friends, we went home and started donating money and supplies again. This past two weeks there have been so many good causes to give to, and the past few days there have been even more. It’s so hard to watch the suffering of people and places that you’ve come to love. We have so much when so many others have so little. Our house and town are relatively unscathed while those just down the road have lost everything. But we’re also grateful to be here, to know that everyone we know is okay, to have the resources to be able to help. At the same time, the people of Mexico are so incredibly inspiring. They’ve had to turn away volunteers both in the southern part of Oaxaca but also in Mexico City – because so many people have come out to help. We’ve watched footage of people emptying out supermarkets and pharmacies (purchasing things with their own money) to provide those goods to the victims and volunteers. Collection centers so full that they’re having to send donations to other locations, and bring in extra people to help sort things. People dropping everything to comfort strangers in the street, run towards collapsed buildings, and dig through rubble with their bare hands to help find someone. This is why we choose to live in Mexico. Because in Mexico, family comes first and you do everything to take care of them. And this country is one big family. Giving to government entities in Mexico can be tricky. Unfortunately, this is a very corrupt system and often your donations never make it to the people who need it the most. A lot of the money and goods stop at the local politician’s front door – where they either use them to personally enrich themselves or just share them with their inner circle. You can read more about that in this NY Times article. So that means that the best way to get help to the people on the ground is through NGO’s (non government organizations) or trusted personal individuals and groups. So that’s who we’ve selected, based on our personal experiences here, and who is known to be trusted in the community. Mexico is suffering – and she could use your help. Here are some of the organizations and individuals we trust. I urge you to give as much as you can. Even small donations go a long way here to helping people – especially in the southern part of Oaxaca. Francisco Toledo is a well known artist and social activist here in Oaxaca. He is originally from Juchitan (one of the towns in the Istmo that was hit the hardest). He is well known for his work protecting and supporting communities and culture throughout the state of Oaxaca. Denise Lechner is a cultural anthropologist who has spent years working with artisan communities throughout Oaxaca, especially in the regions hardest hit by the earthquake. She is a trusted friend of many people we know here in Oaxaca. You can learn more about what she and a group of people have already started to do with the donations they have received over on her Facebook page. They’ve already brought in medical supplies, as well as food, clothing, and other needed supplies to some of the hardest hit smaller villages – where other aid hadn’t reached. We launched this fundraiser to support México  from abroad. Many of you have generously supported different organizations and are deeply grateful for all that you have done. We know that many of you want to continue helping. You can support via the omaze platform https://donate.omaze.com/mexico every bit helps. Gracias a todos. Thank you so much for all of your love and support throughout all of our adventures over the years. And also lots of love and hugs to you for all your thoughts and prayers following the quakes. It’s so nice to know so many people love us and worry about us. Think we'll hang out in Oaxaca for a few months, since we spent a lot of 2018 away. Find life experiences and swallow them whole. Go down some dead ends and explore dark alleys. Exhaust yourself in the glorious pursuit of life.